Bobbi Loomis’s life changed forever when she found out that she had stage 4 skin cancer, a squamous cell carcinoma that caused her left eye to droop and lose most of its vision. Doctors initially told Bobbi her cancer was inoperable, and that the only option they could offer was to try and make her as comfortable as possible in her final months. But Bobbi was determined to beat the odds and pull through. After getting a second opinion from specialists at Stanford Hospital and Clinics she was told she might make it after all. Bobbi’s only chance at survival involved a drastic surgery which would completely sacrifice her ability to see out of her left eye, but it was a sacrifice she told the doctors she was willing to make if it meant saving her life. Since that life-saving procedure, Bobbi has lived her life with one eye, her damaged one often covered in a variety of colorful fabric patches. Despite what she’s lost, the Reno, Nev., resident has kept a positive outlook since getting a second chance at life. Four years ago, shortly after her surgeries, Bobbi met someone else with that same fighting spirit while on her way to a routine visit to the dentist — a Border Collie appropriately named Lucky. Like Bobbi, Lucky also has only one eye. 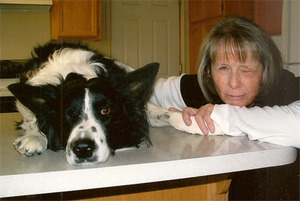 Lucky lost his right eye shortly after he was born when his mother accidentally stepped on his face, causing severe and irreparable damage to the Border Collie’s eye. Veterinarians made the tough decision to remove the permanently injured eye, but Lucky hasn’t let that crush his spirit. Bobbi says she and Lucky hit it off right from the start — so much so that, for the past three years, Lucky spends weeks at a time staying with the Loomis family at their Reno home. Bobbi’s husband, Dave Loomis, agrees. “He’s our little God dog,” Dave says of Lucky. The Loomises want the whole world to know Lucky’s story, calling their special canine companion an inspiration. “What we can learn from Lucky is not to give up on animals just because they’ve got one eye or a leg cut off or something wrong with them,” Bobbi explains.